My father came to Vienna in the early 1920s and worked his whole life as a sales representative for office supplies. He was a traveling salesman and was often in Switzerland and Germany, where he sold pens and other such things wholesale. 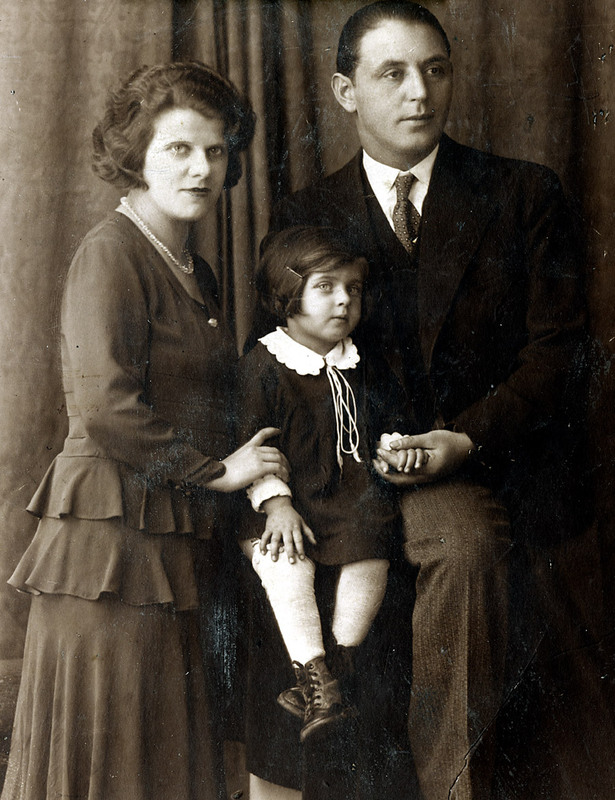 My mother Berta was born in Vienna in 1904. My parents were married in the mid-1920s. I was born in Vienna in 1929 and was the oldest of five children. In 1935, my late father said he could tell that something was coming. In that same year we all emigrated to Palestine. Since my mother was attached to her mother and grandma didn’t receive a visa to travel to Palestine and had to stay in Vienna, my mother suffered a lot. My mother lost weight to the point where she only weighed 40 kilos [approx. 88lbs]. My mother longed for her mother so, because she didn’t know what would become of her and cried so much that my father went from Tel Aviv to Jerusalem, to the Austrian consulate there. When he returned he said, “Berta, I was at the consulate. We can go to Vienna and a return visa will only cost 5 pounds extra.” To which my mother said to him, “forget about the five pounds – nothing in the world could keep me away from my mother. We’re going back to Vienna!” But my father didn’t listen to my mother and took the return visa. That saved our lives. 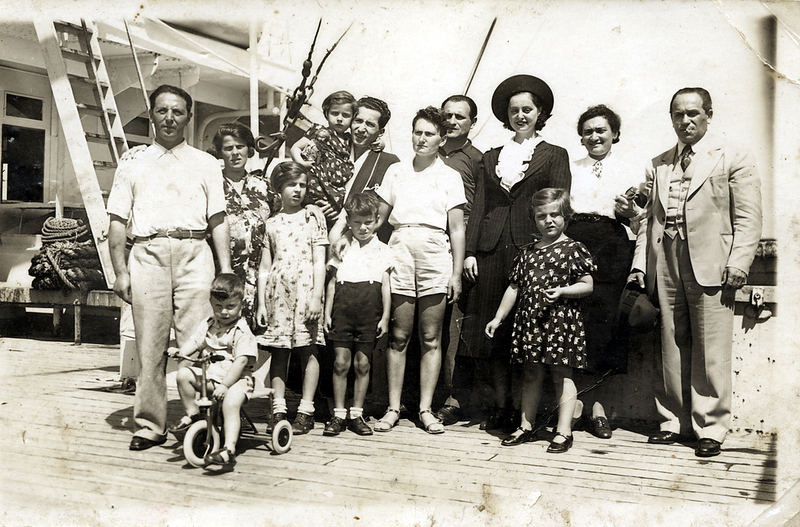 We returned to Vienna in 1937: mom, dad, and four children. We lived with my grandmother in the 20th district. 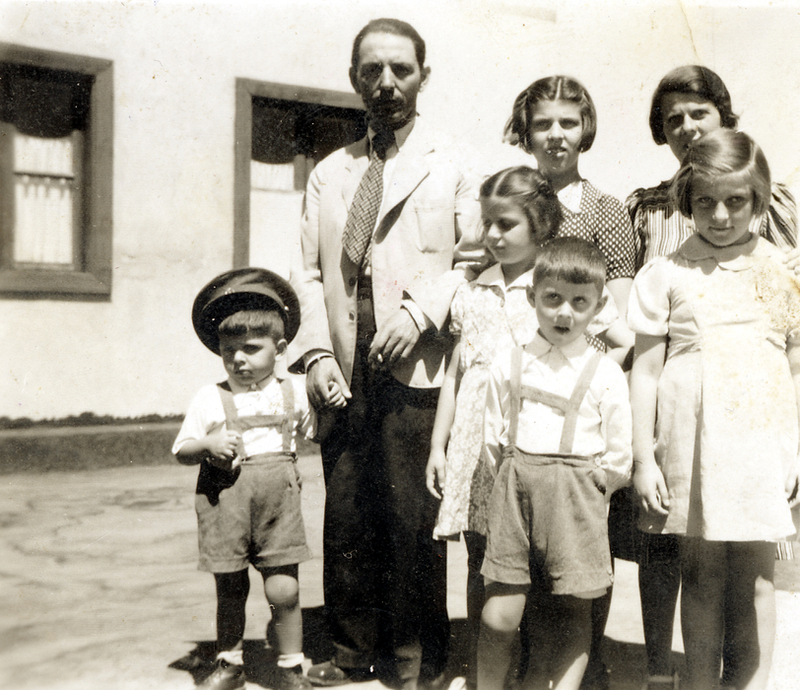 We returned to Vienna in 1937: mom, dad, and four children. We lived with my grandmother in the 20th district. My father was in Germany on business. My mother was heavily pregnant. When Hitler invaded, my father was arrested in Germany and spent a few weeks in the Dachau concentration camp. But since he still had the return visa, they let him go. He travelled from Dachau to Trieste and sent us tickets. We travelled from the train station in Vienna to Trieste. My aunts and grandmother stood at the train station. That’s the last time I saw my grandmother. There were six of us. We were in a refugee camp in Trieste and then travelled by ship to Haifa. As dad brought mom to the hospital for delivery, us girls were distributed amongst three host families. My brother Naftali was the only one they didn’t hand over. Then my father went to Jerusalem and wrote a letter: Berta, I found an apartment in Jerusalem. Follow with the children! 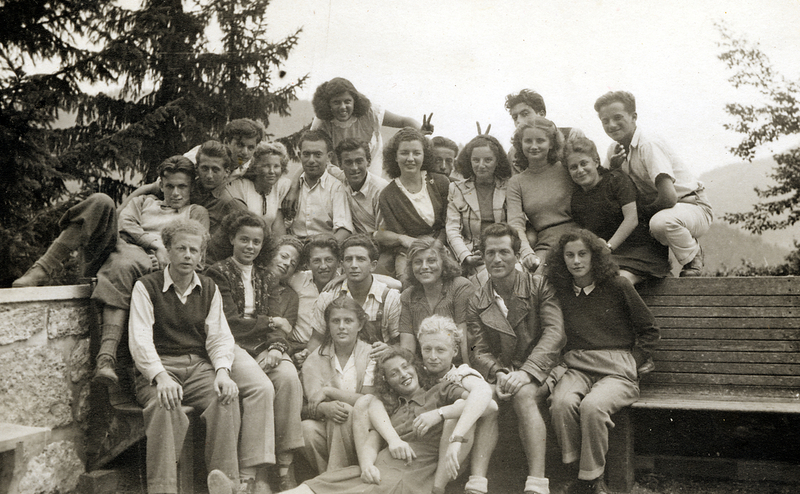 Lizzi Familie 1941 in Jerusalem. Ihr Vater ging auch in Palästina immer mit Anzug und Krawatte. Mutter Berta, Lizzi und ihre Schwestern trugen alle die gleichen Frisuren. In Jerusalem we lived in a small two-room apartment. The apartment was in Beth Israel by the “Hungarian houses,” not far from the Orthodox neighborhood Mea Shearim. Every Saturday morning our dad took us and we walked through The Shuk [a market] to the Wailing Wall. We weren’t very religious, but we always fasted on Yom Kippur and had a kosher Passover. My sisters and I went to a religious school, the Beth Sefer Spitzer Mizrachi school, where you had to pay tuition fees. At age 14 I left school so I could help earn money. During this time in Palestine, there was a lot of unrest between the English and Jewish organizations like the Haganah. There were often curfews. My father couldn’t go to work because of the curfews. We were often locked in for days and didn’t know what we were supposed to eat. It was then a lot worse for us than at the beginning. Once the State of Israel was proclaimed in 1948, I had to register with the military. I said that they should only take me as reserve, since I was working at Kolbo and had to help my siblings and parents. They accepted this and I was exempt. My mother wanted desperately to return to Vienna. Not only because we had barely enough to live off of, but also because she wanted to look for her mother and siblings. I said, “you all can go, but I’m staying here.” My father then said, “do you think I’m going to leave you here alone?” He said to me, “if you stay here, then we’re all staying. But if something happens, it’s your fault.” And so I went along with them to Vienna. For the first few months in Vienna we got an apartment all the way out in Sievering. It was a sort of refugee camp for returnees and the Americans provided us generously with food packages. Then we moved to Hansal-Gasse in the 3rd district and were able to furnish our apartment for free with furniture from a storehouse. Then my siblings emigrated to America. My sister Inge went first. She got married in Vienna and went with her husband to Chicago. Then my brother Naftali followed. My brother emigrated to Canada with 20 dollars in his pocket. They were in Canada for two, three years before returning to Vienna. And then from Vienna they emigrated to America. My sister went first to England. She got married there and then left for New York. Dani was the last one to go to Canada. My parents wanted to remain with their children but couldn’t leave immediately, since my mother had health problems and couldn’t get a visa. They followed later. They couldn’t speak English and had trouble getting by there. They began working in a Jewish nursing home, but they didn’t feel at ease there and came back to Vienna after two years. My husband Leo and I met through my sister Ruth in 1950. From that point on we were together and were married in 1951. Leo was born in Vienna in 1937. He survived the Riga ghetto, the Riga concertation camp and Stutthof, and was liberated in Buchenwald. 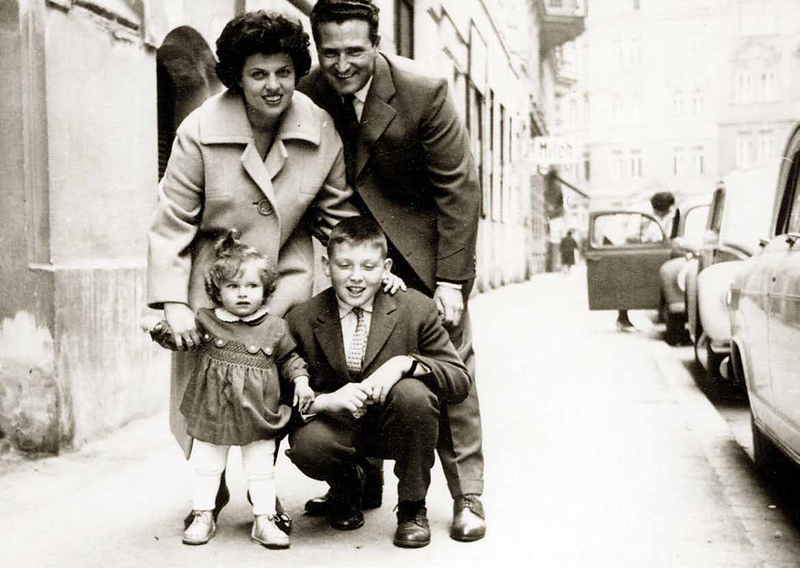 I worked as a saleslady in various shops – until our daughter Dorit was born in 1961. Then I stayed at home. For a while we had a small fabric store on Alserbach-Strasse, where I also worked. But after two years it didn’t do so well. Then we bought a tobacconist’s with money we had saved and worked there for 24 years – until our retirement.